Spyridium scortechinii was previously known as Stenanthemum scortechinii and Cryptandra scortechinii. Spyridium scortechinii is a member of the Rhamnaceae family. Spyridium scortechinii is a small, rounded shrub that reaches a maximum height of 1.5 metres with a spread of 60 centimetres. Lanceolate leaves are about 2 centimetres long. 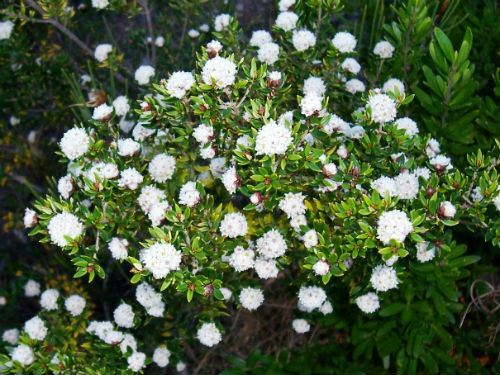 Masses of white, woolly flowers are carried in dense terminal heads and cover plants in spring. They are an eye-catching and unusual feature. Light pruning, after flowering, will promote bounteous blooming. Spyridium scortechinii prefers well-drained sites in full sun or partial shade. We have a number of specimens in our cold climate garden and they have proved to be long-lived, hardy and free-flowering. This handsome shrub could be grown in native cottage gardens and as a foreground shrub in garden beds. The species is found in coastal, tableland and western slope areas of NSW as well as Queensland. The type specimen was collected along the Severn River near Inverell in northern NSW, prior to 1900. There are records of collections made Braidwood and Bermagui in southern NSW. Also the species was collected at Apsley Falls, northern NSW. We have found Spyridium scortechinii on a creek bank about 1.5 kilometres east of our cold climate garden. The species name refers to Rev. Benedetto Schortechini, 19th-century priest and botanist. A cultivar known as “White Mischief” is grown for the cut flower trade. I have been growing Spyridium scortechinii for many years in my garden in the northern Sydney suburb of Westleigh. 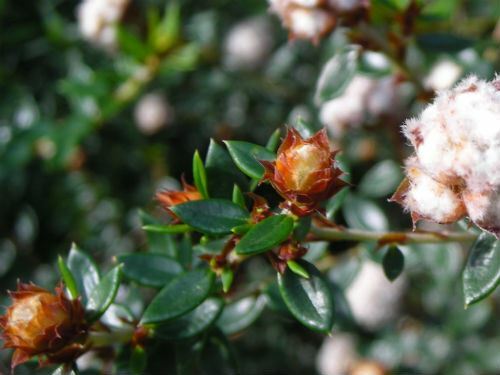 It is a small rounded shrub that grows to about 80 cm high with a spread of 60 cm and produce masses of bronze buds opening to white, woolly flower heads in spring. My plants are growing in a thin layer of topsoil over a clay sub soil and receive little additional watering once established. They are very hardy and grow best in full sun or part shade and also grow well under trees. The plant also tolerates frosts as I have seen them growing in exposed gardens in Moss Vale (NSW). The only maintenance required is light pruning after flowering to keep it compact and promote better flowering next season. If you have soil that retains moisture but is reasonably well drained, then you will find that this plant performs much better than my mostly drier situation. With the additional moisture, they will grow to 1.2 m high by 1.2 m wide and look stunning in full flower. The species occurs naturally in coastal, tableland and western slope areas of New South Wales as well as Queensland and as well would make an ideal addition to a native cottage gardens. It has the added bonus of making attractive and long lasting cut flowers. A cultivar known as ‘White Mischief’ is grown for the cut flower trade.